They say that giving a book to someone is also giving a commitment as people expect you to read it. This is how Bitter Almonds fell into my hands. As many of you, I have a reading waiting list and I promise myself not to buy more books until I’ve read the ones I have in that never ending pile. I must confess I was reading something else when Bitter Almonds appeared. With not too much room in my bag I carried the book in my hand and while on the bus I started reading it. The rest is history. I was hooked. This is perhaps one of the lesser known novels by the French writer Laurence Cossé. But certainly one that had a strong impact in me and that I’ll remember for a long time. The idea behind the novel is simple: literacy. For many reading and writing is as natural as breathing. I can’t even remember that process in my childhood. I was born in a family of readers, in a house with a library that keeps on growing and where you’ll be able to find all sorts of books from classics to mountaineering and landscape gardening books. Reading has always been there, but not for Fadila, Bitter Almonds’ main character. One day, any day, Edith, receives her new housemaid: Fadila, a 60 year old Moroccan lady. Nothing unusual there except that Fadila is illiterate. And this is when the story becomes heartbreaking and an eye opener. Edith is determined to teach Fadila to read and write, and in this process the world of Fadila opens to the reader. Just imagine not using public transport such as the underground because you’re unable to read the stations or the map. Even more, finding your bearings in a big city rely on your memory, street names mean nothing to you. Fadila always takes the bus, the same bus and if there’s a change of route she panics and can’t get to get to work. Using a cash point is unthinkable and therefore the only way is to ask a cashier in a bank to help you fill the slips. Needless to say, Fadila can’t do numbers either. The novel is set in modern day Paris, a city where, like many others, literacy is a given. In today’s world we look around assuming the written word speaks to everyone. But very few times we sit back to think about those who did not have the opportunity or the gift of literacy. Fadila’s journey into learning is truly a very difficult one. I’ve never tried to teach anyone to read and write and since recommending this book on Twitter I was contacted by teachers who read the book and told me that Edith’s and Fadila’s experience was beyond painful and frustrating. I come from a country where illiteracy is not unheard of and as a book lover is easy to forget it. 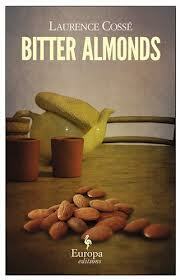 The great achievement of a novel such as Bitter Almonds is that takes you to the core of a life shared by many people all over the world. In a nutshell, never take literacy for granted.